My husband is a wonderful cook. 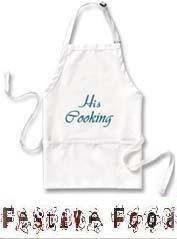 He loves cooking! He usually cooks south indian style food,. Sometimes he puts together the craziest combos and finds them amazing!! I don’t have the heart to tell him. Usually I dont allow him to cook.when I feel sick or busy with my work he use to cook. .when he cooks Just I love his kathrikai pitlai and this kootu. He has made this several times, but somehow I never managed to take a photo.I told him about This event. Exclusively he cooked his fav jeera rasam & pumpkin kootu for Priti's His Cooking Event. Wash, peel the skin and cut the Pumpkin into small pieces. Boil water, add the pieces, chana dhal and turmeric powder. Grind the coconut, cumin seeds and red chilli into a paste. When the vegetable is cooked add the coconut paste and salt. Mix them well. .Heat a pan with oil add mustard seeds, urad dhal, 3tsp of coconut and curry leaves. When the coconut turns into red , add this to the kootu. 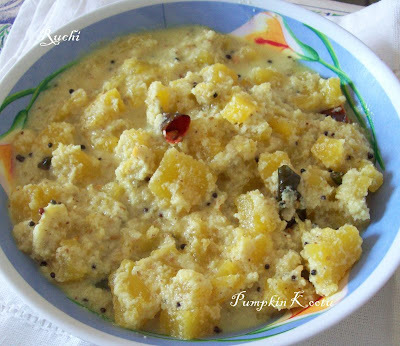 It is very tasty and eat with sambar sadam, &with rasam sadam. This rasam is my husband’s favourite . Can be cooked very fast. Tamarind small size ( soaked in hot water and squeezed to pulp). For seasoning Curry leaves 1 twig, 1 teaspoon ghee. Soak the jeera, red chillies and toor dal in warm water for 20 minutes. Grind to fine paste, add other ingredients and 2 cups water. 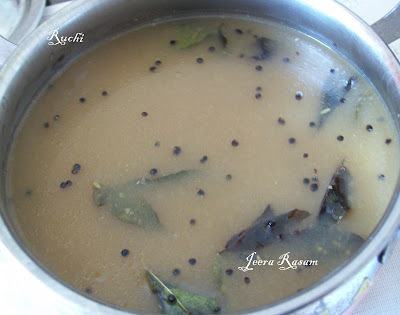 Heat ghee in a small kadai add the curry leaves and fry for a moment, Add to the rasam. Woww both dishes looks super delicious with loads of love, he rocks Akka..u r soo lucky..
Hi we are happy to know that you are interested in the show. If you can send me your email id on the above mentioned email or on the blog itself we will get back to you as soon as possible. i tried this kootu and it came out very well. thanks.